Composition (Figure féminine sur une plage). Images provided by Christie's. 8 May 2013/NEW YORK – AUCTIONS can be pretty dry affairs, but not always. Take the Christie’s Evening Sale of Impressionist & Modern Art on Wednesday, for instance. (A day sale in the same category came the following morning). An extra shot of excitement was injected into the proceedings because at least three of the works up for sale were from famous entertainers, rather than wealthy, anonymous collectors who are/were not household names. Imagine the hoopla at Christie’s when it sold the possessions, including art and jewelry, of Elizabeth Taylor in 2011! 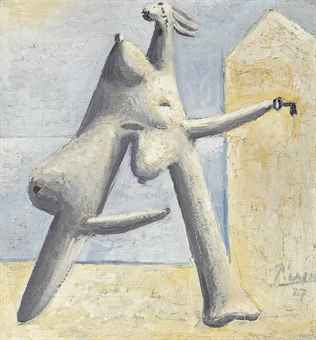 The first lot up for bid Wednesday night was Picasso’s Composition (Figure féminine sur une plage). It is a miniature painting, approximately 7 X 7, featuring a distorted female figurine on a beach. The bidding was spirited and the work quickly went for $1.2 million (hammer price), the top estimated selling price. Fernand Leger’s Les deux figures held great appeal for the Pecks. Composition (Figure féminine sur une plage) is from the collection of entertainer Andy Williams who died last year. Few outside of the art world knew that the singer had a massive love for art. "I could not imagine a life without paintings. I look at my paintings every day … I could not imagine a room without art," he said, according to auction text notes. The Iowa native also collected Juan Gris, Braque, de Kooning and other notables. A de Kooning, Richard Diebenkorn and several other pieces will be up for bid next week (15 May) as part of the Post-War & Contemporary Art evening sale. 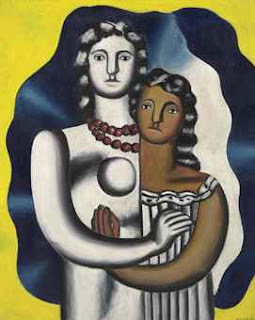 Lot 22 in the Impressionist & Modern Art sale is Fernand Leger’s Les deux figures, featuring two women – lovers, perhaps – staring vacantly (or defiantly) at the viewer. It is from the collection of Veronique and Gregory Peck. “For me, Les deux figures will always tell the story of the abiding love between my parents,” according to a blurb in the notes quoting their daughter Cecilia Peck Voll. 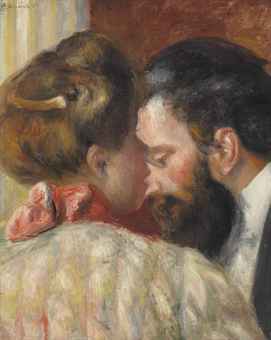 Another Hollywood legend, Greta Garbo, once owned Lot 30, Renoir’s Confidence, an oil on canvas depicting a woman and man in private conversation. It sold for $3.1 million (hammer price). Greta Garbo was once held Renoir's Confidence. So far, 2013 has been a good year for Christie’s. Many of its sales have been a success, often with record-breaking results. The combined sales of 8 and 9 May realized $190.2 million. In the evening sale of Impressionist & Modern Art, a record came in the form of a piece in which Christie’s has a major interest: Chaim Soutine’s Le petit patissier. Featuring a pastry chef – a beautiful young boy – with hands on hips, expression slightly haunted, it sold for $16 million (hammer price), $18 million after all applicable fees. Heretofore, the largest haul for a Soutine work was L’homme due foulard rouge. It sold for $17.2 million in 2007 at Sotheby’s London. 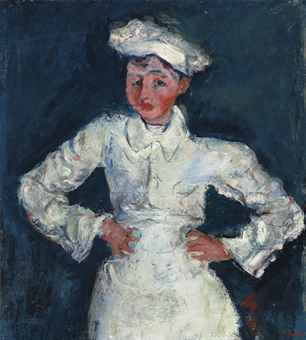 Soutine's little pastry chef is a record-breaker. One of the night’s disappointments, Derain’s demure Madame Matisse au kimono, only attracted $13 million (hammer price). The low estimate was $15 million. At the press conference following the auction Christie’s officials expressed confidence that a buyer would be found, and so it was. “As a fitting finale to a great week of sales, I am pleased to report Derain's spectacular portrait of Madame Matisse already sold to a private collector after the sale," Brooke Lampley, head of Impressionist & Modern Art, noted in a press release issued on Friday (10 May). Visit http://www.christies.com to learn more about the Christie’s Impressionist & Modern Art evening and day sale. 11 May 2013/SANT'AGATA BOLOGNESE, Italy – WHAT a spectacle! A convoy of more than 300 automobiles, nearly three miles in length, snaking along highways from Milan to its final destination of the Emilia Romagna region for a grand party and big reveal. Celebrating 50 years in the sports car business, Lamborghini went big, gathering owners of every model it ever made from all over the globe to join the four-day grand procession. It passed through some of Italy’s most beautiful cities, including Tuscany and Rome. (See video above). Lamborghinis from all over roll into town. 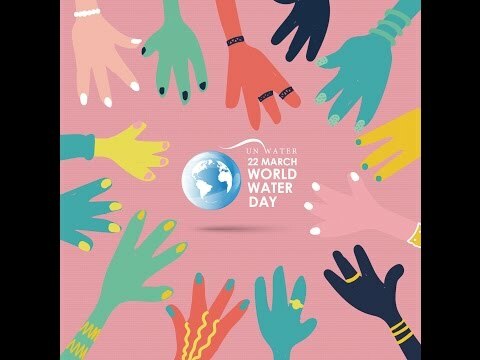 Photo from Wolfango. The final leg of the 50th Anniversary Lamborghini – Grande Giro motored from Bologna to Sant'Agata Bolognese, the town where founder Ferruccio Lamborghini produced the 350 GT in 1963. At Sant'Agata Bolognese, the celebration swung into its highest gear with the reveal of the newest Lamborghinis – Gallardo and Aventador. Happy birthday Lamborghini and many more!